Dianthus plants come in all shapes and sizes, including miniature varieties that form a tight little lump of foliage and blooms, and giant species reaching up to 3 feet tall with almost no basal foliage. These plants are typically mat-forming perennials that form very tight-knit spreads of foliage. As they continue to grow, you may sometimes get dead spots within the center of the foliage. When this occurs, divide the plant and re-plant to encourage new growth and to remove any old, dead foliage. Flowers of the dianthus plant are extremely variable and offer something for everyone. Many of the blossoms include interesting patterns and colors with large blotches of deep reds, or rings of color on the outside of the petals. There are also many blooms that have fully double blossoms. Blooms are also quite fragrant and smell like cloves, with a spicy-sweet floral scent. 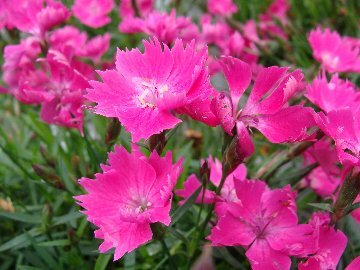 Plant dianthus in a sunny or mostly sunny area in well drained soil. Apply a thin layer of compost each spring, followed by a 2-inch layer of mulch to retain moisture and control weeds. Water plants during the summer if rainfall is less than 1 inch per week. Stake tall varieties to keep them upright. Remove spent blooms on tall varieties, or shear back mounding plants after bloom to encourage re-bloom. After the first killing frost, cut stems back to an inch or two above soil line. Divide plants every 3 to 4 years as new growth begins in the spring, lifting plants and dividing them into clumps. Special features are that they multiply readily, have good fragrance, are good for cut flowers and are deer resistant.